Muscles of the Head are quite unique when compared to all the other muscles spread over the body as they tend to move the skin and other structures more than bone. All the other muscles Origin in a fixed part and Insertion into a movable part. Whereas the muscles of Head are attached to the skin in the Origin part and attached to other muscles or bone in some cases in the Insertion part. Origin of Muscle: The muscle end which is attached to the bone which is fixed and does not move, it acts as the anchor part to move the other part. Insertion of Muscle: The muscle end which is attached to the movable part – Bone or other muscle or ligament or skin. Extraocular: Inferior Oblique, Superior Oblique, Rectus – Inferior, Superior, medial and lateral, Levator palpebrae superioris (superior tarsal). 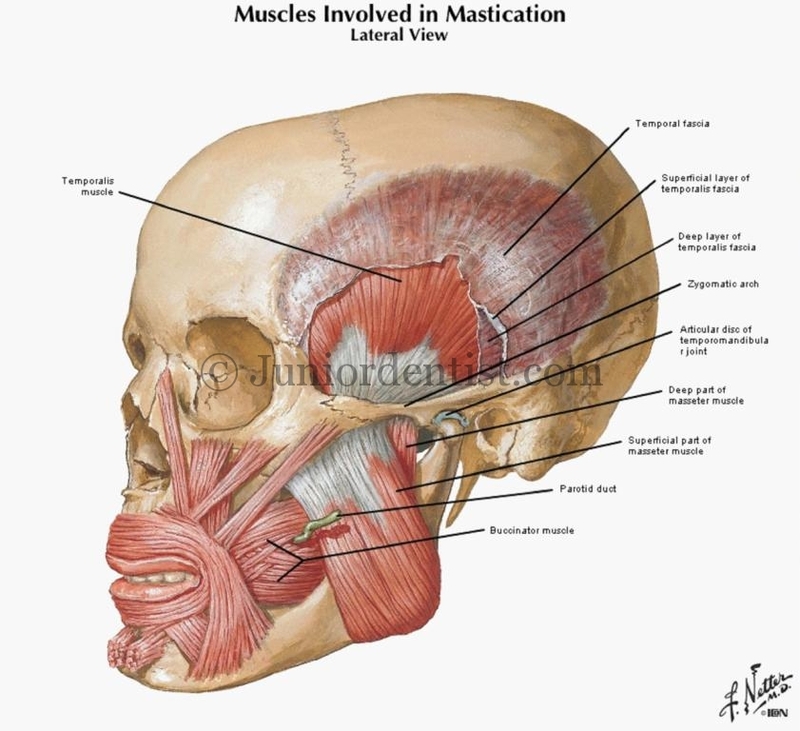 Masticatory: Masseter, Temporalis (sphenomandibularis), Buccinator, Pterygoid – lateral and medial, Fascia – massetric and temporal. Nose: Procerus, Nasalis – dilator naris, Depressor septi nasi, LEvator labii superioris alaeque nasi. Mouth: Levator anduli oris, Risorius, Buccinator, depressor anguli oris, Depressor labii inferioris Mentalis Transversus menti. Soft Palate: Veli palatini – tensor and levator, Musculus uvulae, Palantopharyngeus, Palatoglossus. The muscles of the tongue are unique and the ability of the tongue to transform and maintain many shapes is quite unique. The Tongue is said to be a huge muscle but in reality it is made up of multiple laterally symmetrical muscles with the tongue divided into two parts by a mediam septum. Occipitofrontalis or Epicranius: The name suggests the location of the muscle which is – the occipital belly covers the occipital bone while the frontal belly covers the frontal bone. The Frontal belly of the Occipitofrontalis Originates from the aponeurotica while the Insertion is in the skin of theeye brows. The Occipital belly originates from the occipital bone and inserts into the Aponeurotica. The frontal belly helps in raising the eye brows. The Aponeurotica is a tendon which covers the surface of the skull.